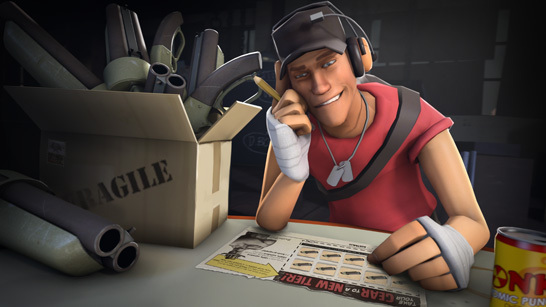 TF2 Blog - "Introducing Trade-ups!" If you haven't already bought a pass to the Gun Mettle campaign, it's not too late! But it will be in a week, because we're going to stop selling them. So this is your last chanceto get a Gun Mettle Campaign Pass. If you're thinking, "The Campaign's almost over, why buy one now? ", the answer is that you'll still get access to all past contracts up until now, in addition to all of the contracts for the remainder of the campaign. There's still five weeks until Gun Mettle's over, soo that's a heck of a lot of chances to snag yourself some one-of-a-kind campaign-exclusive weapons. Speaking of those: If you've got ten campaign-exclusive items just sitting around, we've got good news for you. Now you can trade them in for a higher-tier item! Simply click on any Gun Mettle item in your inventory and choose "Mann Co. Trade-Up" from the drop-down menu to give it a shot! We're also shipping the Gun Mettle Cosmetic case, an exclusive community cosmetic item collection now available as a weekly random drop for folks who own a Gun Mettle Campaign Coin. Just like the weapons, all of these 16 cosmetics have a chance to contain Strange capability, and the nine hats in the collection have a chance at being Unusual. You can also trade up 10 strange variants for a strange variant of the next tier, I just science'd it and got a strange carpet bomber. Wonder if that means you could potentially get a strange variant of the non-unboxables. Strange Bovine Blazemaker would be neat. "Exchange 10 items of identical quality to 1 item of the next highest quality from a collection of one of the items provided"
Unfortunately not possible (yet) considering there are no other stranges in the Teufort and Craftsmann Collections. You might be able to trade up cosmetics, though.